The past week provided important support for the “peak monetary stimulus” thesis. There is mounting evidence that global central bankers are monitoring inflating asset prices with heightened concern. The intense focus on CPI is beginning to blur. They would prefer to be on a cautious path toward policy normalization. When the ECB chose not to offer any policy clarification coming out of its June 8th meeting, wishful markets had Draghi holding out until September. The timeline was moved up, with the ECB president using the bank’s annual meeting, held this year in Sintra Portugal, to offer initial thoughts on how the ECB might remove accommodation. Market reaction was swift. German 10-year bund yields surged 13 bps Tuesday and almost doubled this week to 47bps. French yield jumped 14 bps Tuesday – and 21 bps for the week - to 82 bps. European periphery bonds were under pressure. Italian 10-year yields rose 16 bps Tuesday and 24 bps for the week to 2.16%. Portuguese yields rose 14 bps Tuesday, ending the week at 3.03%. Draghi’s comments rattled bond markets around the globe. Ten-year Treasury yields rose seven bps to 2.21% (up 16 bps for the week), Canadian bonds 11 bps to 1.57% and Australian bonds 10 bps to 2.46%. Emerging market bonds also came under heavy selling pressure, with Eastern European bonds taking a pounding. I don’t see it as the markets misinterpreting Draghi. Understandably, inflated Bubble markets have turned hyper-sensitive to the course of ECB policymaking. The ECB’s massive purchase program inflated a historic Bubble throughout European debt markets, a speculative Bubble that I believe unleashed a surge of global liquidity that has underpinned increasingly speculative securities markets. If not for massive QE operations from the ECB and BOJ, I believe the 2016 global reversal in bond yields would have likely ushered in a major de-risking/deleveraging episode throughout global markets. Instead, powerful liquidity injections sustained speculative Bubbles throughout global fixed income, in the process spurring blow-off excess throughout global equities and risk assets more generally. Recalling the summer of 2007, everyone is determined to see the dance party rave indefinitely. First-half QE has been estimated (by Bank of America) at (an incredible) $1.5 TN. Bubbling markets should come as no stunning surprise. At May highs, most European equities indices were sporting double-digit year-to-date gains. The S&P500 returned (price + dividends) almost 10% for the first half, with the more speculative areas of U.S. equities outperforming. The Nasdaq Composite gained 14.1%, with the large company Nasdaq 100 (NDX) rising 16.1%. Despite this week’s declines, the Morgan Stanley High Tech index rose 20.3%, and the Semiconductors (SOX) jumped 14.2% y-t-d. The Biotechs (BTK) surged 9.7% during Q2, boosting y-t-d gains to 25.6%. The NYSE Healthcare Index gained 7.7% for the quarter and 15.3% y-t-d. The Nasdaq Transports jumped 9.7% during Q2, with the DJ Transports up 5.3%. The Nasdaq Other Financials rose 7.9% in the quarter. Central banks have closely collaborated since the financial crisis. While always justifying policy stimulus on domestic grounds, it’s now been almost a decade of central bankers coordinating stimulus measures to address global system fragilities. I doubt the Fed would have further ballooned its balance sheet starting in late-2012 if not for the “European” financial crisis. In early-2016, the ECB and BOJ would not have so aggressively expanded QE programs – and the Fed not postponed “normalization” – if not for global ramifications of a faltering Chinese Bubble. All the talk of downside inflation risk was convenient cover for global crisis worries. As Mario Draghi stated, the European economy is now on a reflationary footing. At least for now, Beijing has somewhat stabilized the Chinese Bubble. Powered by booming securities markets, global Credit continues to expand briskly. Even in Europe, the employment backdrop has improved markedly. It’s just become difficult for central bankers to fixate on tame consumer price indices with asset prices running wild. Global market liquidity has become fully fungible, a product of multinational financial institutions, securities lending/finance and derivatives markets. The ECB and BOJ’s ultra-loose policy stances have worked to counteract the Fed’s cautious normalization strategy. Determined to delay the inevitable, Draghi now faces the scheduled year-end expiration of the ECB’s latest QE program, along with an impending shortage of German bunds available for purchase. Behind the scenes and otherwise, Germany is surely losing patience with open-ended “money” printing. This week’s annual ECB gathering provided an opportunity for Draghi to finally get the so-called normalization ball rolling. Despite his cautious approach, markets immediately feared being run over. Draghi and the ECB are hoping to duplicate the Fed blueprint – quite gingerly removing accommodation while exerting minimal impact on bond yields and risk markets more generally: Normalization without a meaningful tightening of financial conditions. This is unrealistic. Current complacency notwithstanding, turning down the ECB QE spigot will dramatically effect global liquidity dynamics. Keep in mind that the removal of Fed accommodation has so far coincided with enormous counteracting market liquidity injections courtesy of the other major central banks. The ECB will not enjoy a similar luxury. Moreover, global asset prices have inflated significantly over the past 18 months, fueled at least in part by a major increase in speculative leverage. There are three primary facets to QE dynamics worth pondering as central banks initiate normalization. The first is the size and scope of previous QE operations. The second is the primary target of liquidity-induced market flows. And third, to what extent have central bank measures and associated market flows spurred self-reinforcing speculative leveraging and market distortions. Inarguably, ECB and BOJ-induced flows over recent quarters have been massive. It is also reasonably clear that market flows gravitated primarily to equities and corporate Credit, asset classes demonstrating the most enticing inflationary biases. And there are ample anecdotes supporting the view that major speculative leveraging has been integral to myriad Bubbles throughout global risk markets. The now deeply ingrained view that the cadre of global central banks will not tolerate market declines is one of history’s most consequential market distortions. And while the timing of the removal of ECB and BOJ liquidity stimulus remains uncertain, markets must now at least contemplate an approaching backdrop with less accommodation from the ECB and central banks more generally. With this in mind, Draghi’s comments this week could mark an important juncture for speculative leveraging. Increasingly unstable currency markets are consistent with this thesis. The days of shorting yen and euros and using proceeds for easy profits in higher-yielding currencies appear to have run their course. I suspect de-leveraging dynamics have commenced, though market impact has thus far been muted by ongoing ECB and BOJ liquidity operations. While headlines somewhat paraphrased Yellen’s actual comment, “We Will not see Another Crisis in Our Lifetime” is reminiscent of Irving Fisher’s “permanent plateau” just weeks before the great crash of 1929. While on the subject, I never bought into the popular comparison between 2008 and 1929 – and the related notion of 2008 as “the 100-year flood”. The 2008/09 crisis was for the most part a private debt crisis associated with the bursting of a Bubble in mortgage Credit – not dissimilar to previous serial global crises, only larger and somewhat more systemic. It was not, however, a deeply systemic debt crisis akin to the aftermath of 1929, which was characterized by a crisis of confidence in the banking system, the markets and finance more generally, along with a loss of faith in government policy and institutions. But after a decade of unprecedented expansion of government debt and central bank Credit, the stage has now been set for a more systemic 1929-like financial dislocation. As such, it’s ironic that the Fed has branded the banking system cured and so well capitalized that bankers can now boost dividends, buybacks and, presumably, risk-taking. As conventional central bank thinking goes, a well-capitalized banking system provides a powerful buffer for thwarting the winds of financial crisis. Chair Yellen, apparently, surveys current bank capital levels and extrapolates to systemic stability. Yet the next crisis lurks not with the banks but in the securities and derivatives markets: too much leverage and too much “money” employed in trend-following trading strategies. Too much hedging, speculating and leveraging in derivatives. Market misperceptions and distortions on an epic scale. Compared to 2008, the leveraged speculating community and the ETF complex are significantly larger and potentially perilous. The derivatives markets are these days acutely more vulnerable to liquidity issues and dislocation. Never have global markets been so dominated by trend-following strategies. It’s a serious issue that asset market performance – stocks, bond, corporate Credit, EM, real estate, etc. – have become so tightly correlated. There are huge vulnerabilities associated with various markets having become so highly synchronized on a global basis. And in the grand scheme of grossly inflated global securities, asset and derivatives markets, the scope of available bank capital is trivial. I realize that, at this late stage of the great bull market, such a question sounds hopelessly disconnected. Yet, when markets reverse sharply lower and The Crowd suddenly moves to de-risk, who is left to take the other side of what has become One Gargantuan “Trade”? We’re all familiar with the pat response: “Central banks. They’ll have no choice.” Okay, but I’m more interested in the timing and circumstances. Central bankers are now signaling their desire to proceed with normalization, along with noting concerns for elevated asset prices. As such, I suspect they will be somewhat more circumspect going forward when it comes to backstopping the markets - than, say, back in 2013 with Bernanke’s “flash crash” or with the China scare of early-2016. Perhaps this might help to explain why the VIX spiked above 15 during Thursday afternoon trading. Even corporate debt markets showed a flash of vulnerability this week. FROM shoes to shirts and phones to fridges, made-in-China goods have blanketed the globe over the past three decades, entering every country and just about every home. But one kind of Chinese good few abroad dare touch: its financial assets. Outsiders own less than 2% of its shares and bonds, far below the levels of foreign ownership seen in other markets. Capital barriers and financial risks have put investors off. This, however, is changing. The globalisation of China’s capital markets is slowly gathering steam, as symbolised by the inclusion of Chinese stocks and bonds in global indices. MSCI, a company that designs stockmarket indices, announced on June 20th that it will bring Chinese equities into two of its benchmarks: one that covers emerging markets; and another that follows stocks around the world. To begin, it will include a small number of shares, just 222 of the more than 3,000 listed in China. But its decision matters to asset managers who track their performance against MSCI’s indices or who invest in exchange-traded funds linked to them. They will in effect be forced to allocate capital to China’s stockmarkets, many for the first time. Because MSCI is giving Chinese stocks a limited weighting (0.73% of its emerging-markets index), the resulting cash inflows could add up to only about $10bn next year, equivalent to less than one hour of trading in China’s frenetic markets. Yet the weighting is likely to increase in the coming years. It was a contentious decision, despite China’s size. The country accounts for 15% of global GDP. 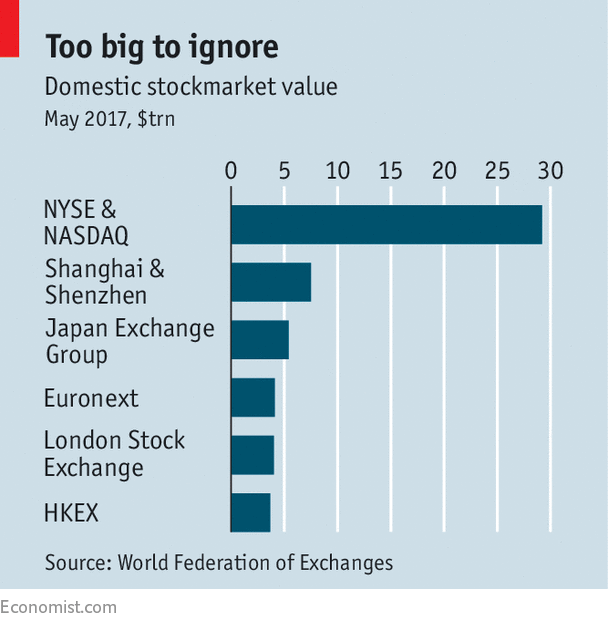 Its stockmarket, housed in exchanges in Shanghai and Shenzhen, is the world’s second-biggest (see chart). But for each of the past three years MSCI had debated whether to add Chinese shares to its indices, only to back off each time because of restrictions on foreign investors. Gaining access to China’s markets was—and is—hampered by formidable obstacles. Because of China’s tightly managed capital account, foreigners can only buy shares through a few quota-controlled channels. MSCI concluded that enough had been done to allay such concerns, largely thanks to a scheme that lets foreigners buy mainland stocks in Hong Kong. Foreign institutions already hold Chinese shares but until now have mainly focused on firms listed in Hong Kong and America. These overseas Chinese stocks form 28% of the MSCI emerging-markets index. But onshore Chinese stocks are collectively much more valuable. They also encompass a far wider range of companies. The pensions and university endowments that follow MSCI will now own shares in makers of traditional Chinese medicine and distillers of baijiu, a fiery grain liquor—albeit only in tiny amounts invested passively through index trackers. Chinese fund managers hope that the MSCI seal of approval might also entice active investors. “If you like Chinese food, you should go to China and have the real food. It is so much more diverse and authentic,” says Wang Qi, chief executive of MegaTrust Investment, a Shanghai-based fund manager. But many foreigners still shun the local fare. The stockmarket remains rife with insider trading and price manipulation. Memories of a debacle in 2015, when authorities intervened heavily after a bubble burst, also remain fresh. Chinese regulators are betting that greater participation by international institutions will help bring order. China’s bond market could prove just as significant in integrating its financial system with the rest of the world. In May the central bank announced that foreign investors would be able to buy onshore bonds via the Hong Kong bond market. This programme, which is expected to start in July, will pave the way for bond indices to include Chinese debt. Again, the gap is glaring: China’s bond market is the world’s third-biggest but is excluded from the main global bond indices. Analysts with Goldman Sachs forecast that inclusion could spark inflows of up to $250bn by 2020. Over the past half year both Bloomberg and Citigroup have started to add China to their emerging-market bond indices. For China-focused financiers, all this serves as belated recognition. “I’m not saying institutions should have 15% exposure to China. But they should certainly have somewhere north of zero,” says Peter Alexander of Z-Ben Advisors, a Shanghai-based consultancy. Looked at narrowly, the index inclusions might seem technicalities. 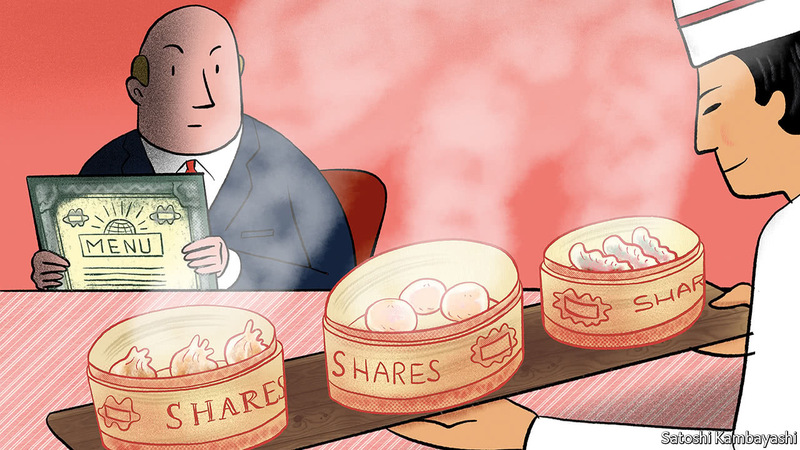 They are simply judgments about the accessibility of Chinese shares and bonds, not their value or prospects. And with minimal weights assigned to China, the inclusions are symbolic. But symbols can be powerful, as these certainly are. Some of the leading gatekeepers of global markets think China is at last open for business. JULY 4th ought to bring Americans together. It is a day to celebrate how 13 young colonies united against British rule to begin their great experiment in popular government. But this July 4th Americans are riven by mutual incomprehension: between Republicans and Democrats, yes, but also between factory workers and university students, country folk and city-dwellers. And then there is President Donald Trump, not only a symptom of America’s divisions but a cause of them, too. 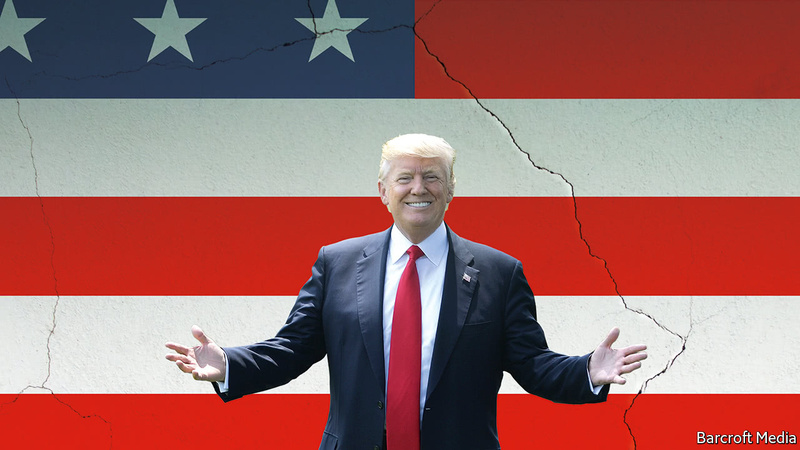 Mr Trump won power partly because he spoke for voters who feel that the system is working against them, as our special report this week sets out. He promised that, by dredging Washington of the elites and lobbyists too stupid or self-serving to act for the whole nation, he would fix America’s politics. His approach is not working. Five months into his first term, Mr Trump presides over a political culture that is even more poisonous than when he took office. His core voters are remarkably loyal. Many businesspeople still believe that he will bring tax cuts and deregulation. But their optimism stands on ever-shakier ground. The Trump presidency has been plagued by poor judgment and missed opportunities. The federal government is already showing the strain. Sooner or later, the harm will spread beyond the beltway and into the economy. America’s loss of faith in politics did not start with Mr Trump. For decades, voters have complained about the gridlock in Washington and the growing influence of lobbyists, often those with the deepest pockets. Francis Fukuyama, a political theorist, blamed the decay on the “vetocracy”, a tangle of competing interests and responsibilities that can block almost any ambitious reform. When the world changes and the federal government cannot rise to the challenge, he argued, voters’ disillusion only grows. Mr Trump has also fuelled the mistrust. He has correctly identified areas where America needs reform, but botched his response—partly because of his own incontinent ego. Take tax. No one doubts that America’s tax code is a mess, stuffed full of loopholes and complexity. But Mr Trump’s reform plans show every sign of turning into a cut for the rich that leaves the code as baffling as ever. So, too, health care. Instead of reforming Obamacare, Republicans are in knots over a bill that would leave millions of Mr Trump’s own voters sicker and poorer. Institutions are vulnerable. The White House is right to complain about America’s overlapping and competing agencies, which spun too much red tape under President Barack Obama. Yet its attempt to reform this “administrative state” is wrecking the machinery the government needs to function. Mr Trump’s hostility has already undermined the courts, the intelligence services, the state department and America’s environmental watchdog. He wants deep budget cuts and has failed to fill presidential appointments. Of 562 key positions identified by the Washington Post, 390 remain without a nominee. As harmful as what Mr Trump does is the way he does it. In the campaign he vowed to fight special interests. But his solution—to employ businesspeople too rich for lobbyists to buy—is no solution at all. Just look at Mr Trump himself: despite his half-hearted attempts to disentangle the presidency and the family business, nobody knows where one ends and the other begins. He promised to be a dealmaker, but his impulse to belittle his opponents and the miasma of scandal and leaks surrounding Russia’s role in the campaign have made the chances of cross-party co-operation even more remote. The lack of respect for expertise, such as the attacks on the Congressional Budget Office over its dismal scoring of health-care reform, only makes Washington more partisan. Most important, Mr Trump’s disregard for the truth cuts into what remains of the basis for cross-party agreement. If you cannot agree on the facts, all you have left is a benighted clash of rival tribes. Optimists say that America, with its immense diversity, wealth and reserves of human ingenuity and resilience can take all this in its stride. Mr Trump is hardly its first bad president. He may be around for only four years—if that. In a federal system, the states and big cities can be islands of competence amid the dysfunction. America’s economy is seemingly in rude health, with stockmarkets near their all-time highs. The country dominates global tech and finance, and its oil and gas producers have more clout than at any time since the 1970s. Those are huge strengths. But they only mitigate the damage being done in Washington. Health-care reform affects a sixth of the economy. Suspicion and mistrust corrode all they touch. If the ablest Americans shun a career in public service, the bureaucracy will bear the scars. Besides, a bad president also imposes opportunity costs. The rising monopoly power of companies has gone unchallenged. Schools and training fall short even as automation and artificial intelligence are about to transform the nature of work. If Mr Trump serves a full eight years—which, despite attacks from his critics, is possible—the price of paralysis and incompetence could be huge. The dangers are already clear in foreign policy. By pandering to the belief that Washington elites sell America short, Mr Trump is doing enduring harm to American leadership. The Trans-Pacific Partnership would have entrenched America’s concept of free markets in Asia and shored up its military alliances. He walked away from it. His rejection of the Paris climate accord showed that he sees the world not as a forum where countries work together to solve problems, but as an arena where they compete for advantage. His erratic decision-making and his chumminess with autocrats lead his allies to wonder if they can depend on him in a crisis. July 4th is a time to remember that America has renewed itself in the past; think of Theodore Roosevelt’s creation of a modern, professional state, FDR’s New Deal, and the Reagan revolution. In principle it is not too late for Mr Trump to embrace bipartisanship and address the real issues. In practice, it is ever clearer that he is incapable of bringing about such a renaissance. That will fall to his successor. What Can China and the U.S. Learn from Each Other about Retail? George Hongchoy is the CEO of Link Asset Management Limited, which includes the Hong Kong listed Link Real Estate Investment Trust — the first REIT in Hong Kong and the largest in Asia. The experience of his company acquiring a large number of retail properties from the government, then upgrading them, gives him a unique view of how the retail sector in Hong Kong and China is evolving. In this Knowledge@Wharton interview, he offers his views on online-to-offline retail, the differences between the retail sectors of China, Hong Kong and the U.S., and what lies ahead. Hongchoy is also chairman of the supervisory committee of the Tracker Fund of Hong Kong, an exchange traded fund that follows the performance of the Hang Seng Index. He was named Business Person of the Year in Hong Kong as part of the DHL/SCMP Hong Kong Business Awards in 2015, and he received the Asian Corporate Director Award from Corporate Governance Asia. He was also named the Best CEO by FinanceAsia’s poll of Asia’s best companies in 2012-2015. Knowledge@Wharton: Please tell us about your company. George Hongchoy: The Link Real Estate Investment Trust — or Link REIT, as we refer to it — was listed in 2005. It was the first real estate investment trust in Hong Kong. It acquired a portfolio of community shopping centers from the Hong Kong government. The government had been building these shopping centers as part of low-cost housing real estate, and the properties were put into the REIT…. We have since been transforming these assets, improving the retail space. Over time we have also expanded beyond Hong Kong to China, with assets now in Beijing, Shanghai and Guangzhou. We have also expanded into new property types. Beyond the retail properties we also have offices, office buildings and car parks. The market cap of Link REIT is now roughly $18 billion. Knowledge@Wharton: How do REITs in Hong Kong differ from those in U.S.? Hongchoy: To a large extent, how [REITs are] operated is very similar. The income, at least 90% of the income, needs to be distributed. We do not have the tax advantages of REITs in the U.S. … [which is] the only major difference, but by and large the main features are similar with gearing limits and with the minimum payout. The history obviously is that the REIT market really started in the U.S. in the 1960s and there are now over 1,000 REITs in the U.S. In Hong Kong there are only about a dozen, so it is a new market; it’s a new investment vehicle. But we have a lot of interest from investors all around the world and also retail investors in Hong Kong. Knowledge@Wharton: We know that in the U.S., bricks-and-mortar stores are suffering — not only the stores but whole chains have been going out of business at a pace we haven’t seen for years, even as the U.S. economy seems to be improving. One result: A lot of malls have vacancies, a lot of malls are closing, or they are trying to repurpose their space and put in health clubs, office space and other uses. The culprits usually cited are the fact that there are too many stores in the U.S. and so there is a shakeout underway. The other big cause cited is competition from online sales, notably Amazon, often through the use of mobile. How does the retail experience for brick-and-mortar properties in Hong Kong and China differ from the U.S.? Hongchoy: The history of the development of consumer sectors overseas is very different, yet we have seen a somewhat similar sort of trend growth of online retail. But the experience of having only started building shopping centers in the last 10 to 15 years means that there are not a lot of properties that were here 20 or 30 years ago, which don’t fit a current purpose as in the U.S., where some of them really have to change the layouts, and the type of services and products they are offering in the mall. The Chinese consumer market has been growing rapidly, although it has seen some slowdown, but it still far exceeds the global average growth. We’ve seen double-digit growth in the early parts of 2010-2014. More recently, in 2016, it was still growing by 7%. So we have very strong growth in consumer spending, and the government policy is also shifting towards the consumer-driven rather than export-driven, which has helped consumer growth. And, wage levels have increased quite a lot in the last 10 years. Online has indeed grown very fast. It now accounts for 13.5% of total retail sales compared to only 7.7% in the U.S. [A big part of the reason for that] is ownership of smartphones, especially in the last few years – there are very well-developed mobile payment solutions, and very easy and inexpensive delivery services. A lot of Chinese shoppers like to compare prices, and so online allows them to do that more easily than walking from shop to shop. A combination of these factors has helped. I know [Wharton] professor David Bell has written a lot about what sort of products should be online or offline. We also are seeing, similar to other countries, that the online companies are also moving to have an offline presence and building a physical presence, or investing in physical retail chains. Over time it’s really a merger of the two experiences, to serve the consumers wherever they want to shop. Knowledge@Wharton: In the U.S., you’ve got Bonobos and Warby Parker, and now Amazon has some physical stores. They are working to create a more seamless experience between the physical store and the online experience. What do you see in Hong Kong and China that relates to this approach? Are there lessons for the West? Hongchoy: We have to realize firstly that a lot of people in China have never owned a PC, have never had a fixed line. So when mobile comes along, that’s the first thing that they have. What happened to drive the whole change is that the barrier to entry is a lot easier when you’re thinking about only building a business on mobile. So, skipping that technology legacy has helped China and a lot of the businesses to grow a lot faster. And in the consumer mindset — every shopper is really just thinking about, “Okay, I want to buy something. How fast can I do that? What is my journey?” And during that journey, whether it is through the app or through the experience, they can actually gain some pleasure out of it. So there’s a lot of talk about that experience-based business model rather than the transactional — how we can actually make this fun for people. Even buying weekly groceries, why should that be a chore? Can’t it be fun? Those are some of the things that I think a lot of businesses in China have been trying to come up with — new models for doing it. And maybe this is a part of globalization, but a lot of U.S. companies are trying to learn how China is doing it, and a lot of Chinese companies are going to the U.S. to learn. I think there are a few advantages, though, in China. One is the payment solution. Most of the consumers in China either use Alipay or WeChat Pay. And having only one or two, or very few payment solutions will help the shoppers because they don’t have to open their wallet and choose from 10 different ones, and think “which one should I use this time?” On the flipside, merchants also do not have to install that many options — they wouldn’t know which shopper uses which [payment method] and so they would have to install ten different machines on the countertop [if there were many payment solutions]. So, having fewer payment solutions [helps]. I see that in the U.S., Amazon and eBay don’t really have a payment system well-embedded in their own platforms — relying on, I guess, other payment platforms. That is one issue. The other is this incumbent problem. If some of the retailers already have “X” number of stores, the incentive to move towards online becomes more difficult because every time the decision is, first, about how to strengthen the current physical presence. It makes the decision a lot more challenging. But if you don’t do it, I guess someone else will be eating your pie — you have to react. The other thing I have noticed is that the consumer does want to go online to do a lot of research, but at the end of the day they want that physical touch and feel in the store, and so that cannot be replaced. In the end, I think one thing that is important is the social aspect of being with other people — whether it’s family, friends or classmates — in a physical location. That is something that [will continue]. But it has to be fun. So how can you make it easy [for consumers]? Make sure they know how to find what they want — whether there’s a parking app to find their car or an e-directory. And [retailers need] the sort of data analytics to understand the type of customer coming into the mall. There is a lot of research being done on both sides, both in the U.S. and Asia. And I think retailers are less worried than five years ago when everybody was sort of scared that it could be the end of physical retail. Now I think people have understood it more, and O2O [online to offline] has become the buzz word these days. Knowledge@Wharton: In Hong Kong, e-commerce and mobile shopping haven’t caught on as much as in China, partly because of Hong Kong’s unique geography. It’s compact; it’s easy to get around. Can you talk about that difference, and also, I’m wondering if what you see in Hong Kong would also apply to places in the U.S. like New York City, for example? That’s also island. Hongchoy: In Hong Kong or any compact city with high density, a good transport network does help because then it’s easy to get to the shops. And shop hours: Hong Kong shopping centers and shops tend to remain open very late into the night hours. Some people work until very late; in a lot of cities you can’t find anywhere to pick up your food [when it’s late], and there are other things that you want, but in Hong Kong the hours that shops remain open helps. And then we have very small apartments [in Hong Kong]. When you have small apartments, the consequence is that it is very hard to entertain your friends and relatives at home. Shopping centers provide a place [and become] a much bigger part of your social life – it is not just for shopping but also for dining and entertaining. So, it’s not too different in New York – there are a lot of restaurants, and they do very well. And [another] trend seems to be the case in a lot of places in the last couple of years where people have moved away from this heavy consumerism. How many shirts and pairs of trousers can you buy? The past recession also made people [conscious of owning so much], and so now there is not a revolution — but certainly people are saying, “We actually want the experience; we actually want the entertainment, the gathering of people” and all that. In a compact city, that’s even more so than in a more spread out country. In Hong Kong, the number of people shopping online has still gone up a lot — from 7% in 2004 to about 23% in 2014. The number is still behind China, but it is indeed rising, and people are trying it. And I think that is certainly the experience for any similar city, whether it’s New York or London. MADRID – As many analysts have observed, the Pax Americana of recent decades is on life support. After the first 150 days of Donald Trump’s “America First” – or, more accurately, “America Alone” – presidency, it seems that America’s traditional stabilizing role can no longer be viewed as a given. As the primacy of the US in the international arena – and, thus, America’s status as the world’s “indispensable nation” – erodes, other states and even non-state actors are gaining prominence. What does this mean for the so-called liberal international order? Burgeoning multipolarity does not have to be at odds with an inclusive and mutually beneficial global system. Rising powers like China are equipped to act as responsible stakeholders. And the European Union, which seems to be regaining its confidence, can still be counted on to play a constructive role. In international relations theory, “liberal internationalism” is characterized by the promotion of openness and order, and is enshrined in multilateral organizations. At the end of World War II, these principles provided the ideological foundation for treaties such as the General Agreement on Tariffs and Trade, which would later develop into the World Trade Organization. The Cold War greatly damaged the globalizing ambition of liberal internationalism, a creed closely associated with the geopolitical West, and especially with the US and the UK. The fall of the Berlin Wall in November 1989 resulted in a period of indisputable hegemony for the US, and paved the way for the spread of governing structures promoted by the West. But that diffusion didn’t occur as fast, or as widely, as anticipated. Today, the world remains fragmented. The September 11, 2001, attacks in the US led many countries to close ranks around America. But the attacks also revealed a deeper trend toward disruption by unexpected actors – a trend that would only grow stronger over the subsequent 15 years. The divergence among countries was economic as well. Not even the “Great Recession” of 2007-2009 was as global as conventional wisdom in the developed countries suggests. In 2009, when global GDP contracted, the economies of the world’s two most populous countries, China and India, grew at rates above 8%. The countries that are unraveling the liberal order today are those that invested the most political capital in creating it. Brexit in the UK and Trump’s election in the US reflect growing frustration with some economic and social effects of globalization, such as offshoring. This frustration has revitalized a form of nationalism based on exclusion. A renewed emphasis on Westphalian sovereignty is spreading, leading some to predict that great-power rivalries will again be the order of the day. Proponents of this school of thought often point to the US-China relationship as the most likely source of friction. In doing so, however, China is not openly calling into question the foundations of the liberal order. The remarkable communiqué from world leaders participating in the BRI Forum in Beijing last month committed more than 30 countries and international organizations to the promotion of “peace, justice, social cohesion, inclusiveness, democracy, good governance, the rule of law, human rights, gender equality,” and the empowerment of women. It would be a mistake to interpret this communiqué literally, or to ignore China’s neo-mercantilist tendencies and illiberal domestic regulations. But neither would it be correct to view China as a monolith, with values that are entirely incompatible with those attributed to the West. Such an oversimplification is no more accurate for China than it would be for the US, where Hillary Clinton won the popular vote over Trump, or the UK, where those who wanted to remain in the EU lost the Brexit referendum by the slimmest of margins. At this time of uncertainty and disharmony, the EU is in a position to assume a leading role. Emmanuel Macron’s victory in the French presidential election should encourage defenders of a liberal order, which, despite its deficiencies, still represents the most attractive and flexible paradigm for international relations. A united EU can also help catalyze reforms that might reinvigorate ailing multilateral institutions, injecting them with new momentum. If we reach out to emerging countries, it is not too late to construct a truly global order. Unlike after 1989, however, this time we must not leave the job unfinished. The U.S. media capitalize on division. 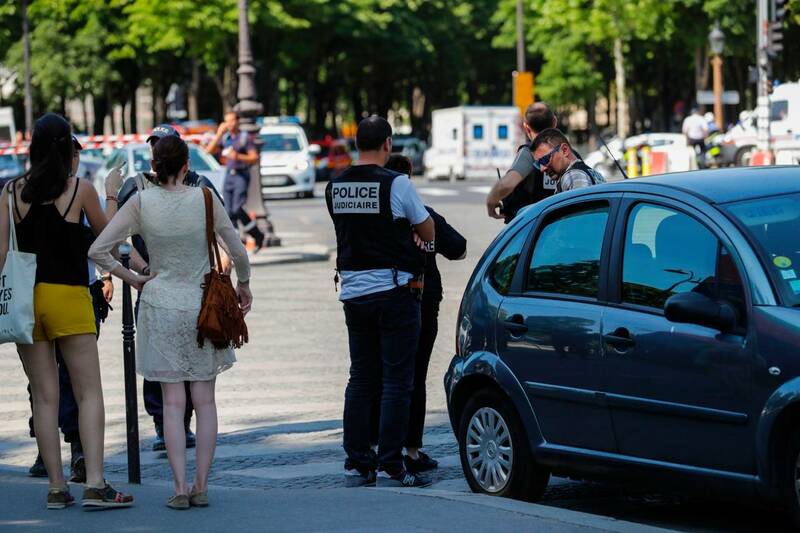 Meantime, Parisians hardly notice a terror attack. Here is a column on two very different topics. If my editor is clever he will find a common theme. The first has to do with the national media climate at this time of political uncertainty, anxiety and division. I suspect at least half the country (those who support President Trump, have reserved judgment about him, or just want the news straight) feel they can no longer trust, or feel actively excluded by, mainstream entertainment and news. What we need from media folk is a kind of heroic fairness. What we have instead is endless calculation. Last week the subject was the divisive nature of so much of our entertainment culture, especially late-night talk shows. We are living in a time of the politicization of everything. You cannot, at the end of a long day, relax with a talk show because it will take a highly political point of view, in a dominant and aggressive manner, as if politics were not part of life but life. It is obnoxious and assaultive. It effectively tells the audience: ‘We only want you here if you agree with us. If you like Donald Trump, get lost.” Some news shows take a similar approach. Dislike of Mr. Trump within the mainstream media is unalterable. It permeates every network, from intern to executive producer and CEO. Here is a theory on what they’re thinking: They’re thinking attempts at fairness and balance in this charged atmosphere get them nowhere. They’re attacked by both sides. And anyway they think Mr. Trump is insane. So, if you are a person who programs or sets the tone of network fare and you want to take a side—you shouldn’t, but you want to!—you throw your lot with the anti-Trump demo, serving them the kind of journalistic approaches and showbiz attitudes they’re likely to enjoy. Mr. Trump, you are certain, won’t last: He’ll bring himself down or be brought down. You want to be with the winning side. So play to those who hate him, exclude others, call it integrity and reap the profits. That is my theory: media bias now is in part a financial decision, instead of what it used to be, a good old-fashioned human and institutional flaw. But I do think it’s part of what is going on. I add only that it’s not only cynical and destructive, as a business strategy it’s stupid. Bias is boring. It’s predictable, rote, is an audience-limiter. What has value at a time like this is playing it straight and presenting the facts. That’s what they ought to do instead of taking a side. I was traveling this week for work, in Europe. When we arrived at Charles de Gaulle Airport in Paris, passport control was closed down. Many hundreds of people milled about confusedly. An airline worker said two unattended bags had been found and security personnel were on the scene. Officials might have to explode the bags where they are. Will there be any warning? Yes, I was told, they’ll tell us before and we’ll hear it. Does this sort of thing happen often? “A few times a day,” an attendant said. There was no air of alarm, and everyone around us was pleasant. After 35 minutes passport control opened, without an explosion. The attitude was that this was par for the course, just another day at the office. Soon I was in a small crowd being held back by a handful of police. They protested: My work is there. I must go there. I walked for a few blocks, to a small park off the Champs. Police had put up police tape, but as soon as they turned away people ducked under it and continued on their way. No one in the crowd—workers in the shops, mothers with children, tourists—seemed the least put out or concerned, never mind scared, which they were not. A man had crashed his Renault into the front car of a police convoy. The assailant was later killed. Officers searched his car and found weapons and explosives, reportedly including gas canisters, handguns and a Kalashnikov. The assailant was said to be in his early 30s, from a Parisian suburb, and known to police. A few hours later at an outdoor cafe I watched as people rode by on scooters and motorcycles. The sidewalks were busy, bright, sun-dappled at dusk. Young people were strolling by and staring down at their phones. Strolling and scrolling, all as carefree and relaxed as any other day. “At least you’re having a very French experience then,” my colleague replied. I was. Forty-eight hours later, en route to England, I saw the front page of the Times of London: A suspected terrorist had been shot and killed by soldiers in a Brussels railway station. He had attempted to detonate an explosive vest or belt. The story was illustrated with a photo of a handsome young passerby who’d been staring at his phone and suddenly turned toward a flash of light behind him: the late terrorist. Nothing feels different, all looks the same, no one is letting the discomfort get in their way, but in Europe, terrorism is the new normal. And much is made of what remains of British stoicism, but something should be said for French sang-froid. My editor discerns this theme: Perhaps there is a happy medium somewhere between bitter division and blasé complacency.